the beginning of a major public leader's term of office. the opening or first public use of a new civic area, organisation or project. Such as a museum, hospital or film studio. to the beginning or introduction of a new system, policy, or period. the first, maiden or initial use of something. For example, a ship, railway or even computer service of some kind. 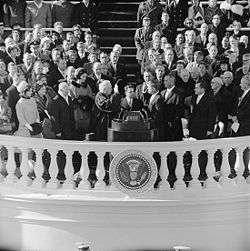 Political inaugurations often feature lavish ceremonies, in which the figure publicly takes his or her oath of office, sometimes called "swearing-in", often in front of a large crowd of spectators. A monarchical inauguration is similar to what some countries may be called a coronation or enthronement. An inauguration site is a ceremonial site that is for someone of a public figure. ↑ "Cambridge Dictionary's Entry on Inauguration". Cambridge English Dictionary. ↑ "Reverso's Entry on Inaugural". dictionary.reverso.net. ↑ "Oxford Dictionaries' Entry on Inauguration". Oxford Dictionaries.